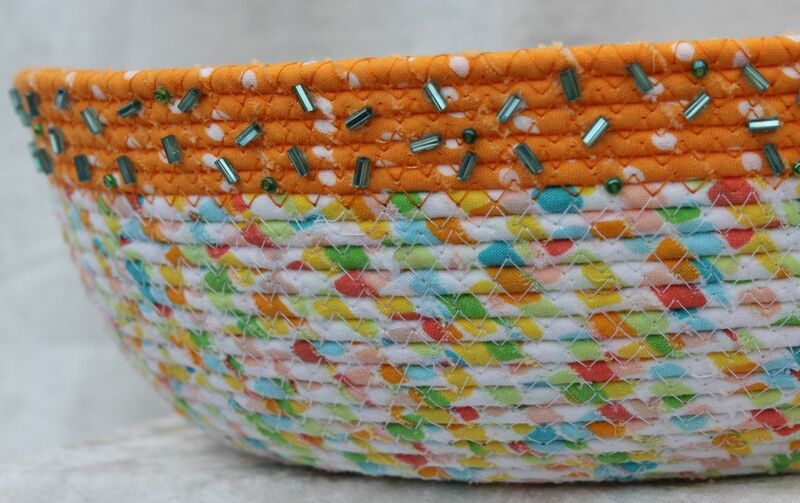 This BOWL has been crafted by hand wrapping strips of fabric onto clothesline and then machine sewn with a zig zag stitch. 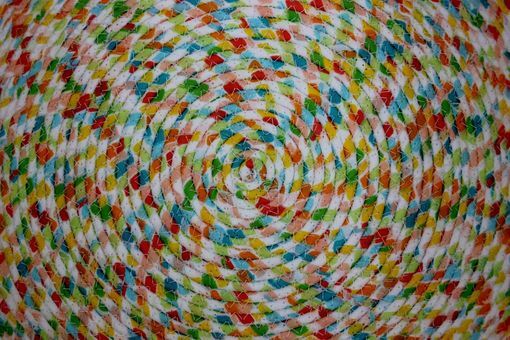 Fabric pattern resembles confetti with colors of greens, blues, melon, pinks, yellows . . . every color in the rainbow!!! 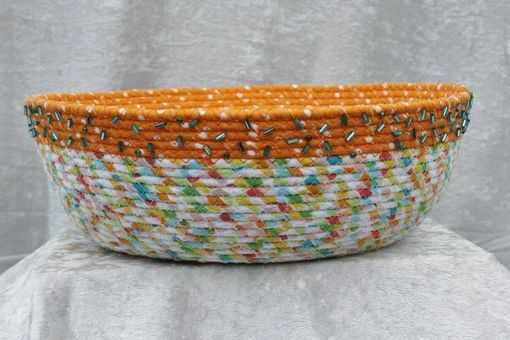 Top three rows are trimmed in melon colored fabric with beaded accents of blue on the outside of the bowl. 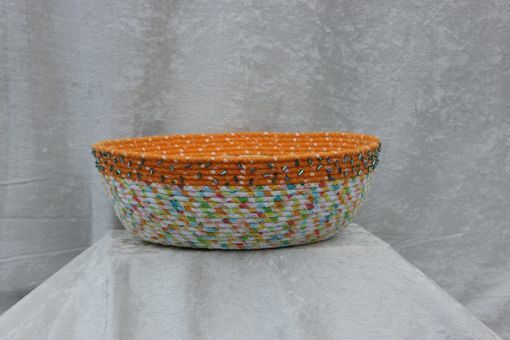 Bowl measures 9.5 inches in diameter, and approximately 3.5 inches deep. Piece can be spot cleaned with warm water and a mild detergent. 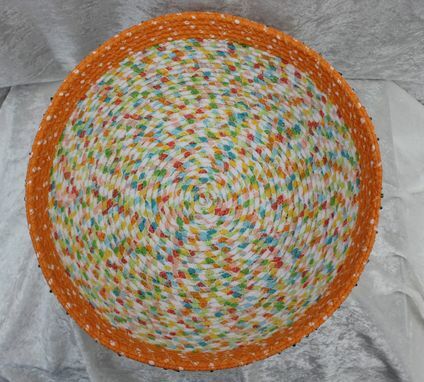 Beautiful accent piece for any table, counter, desk, etc. Bowl is not only pretty, but functional! Use it for storage, or serving your favorite snack (dry). 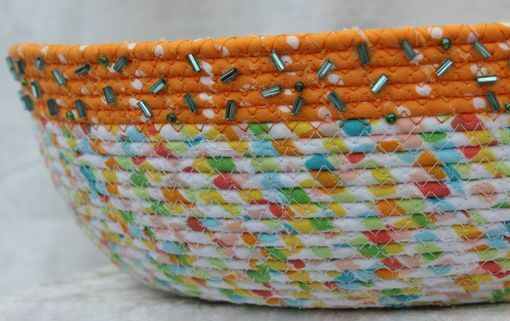 Simply place a paper towel inside the bowl before filling. This piece would also be an adorable baby gift idea. Fill it with baby items, wrap a bow around it, and take it to a baby shower! Pieces are securely constructed and will last a very long time - if not forever!